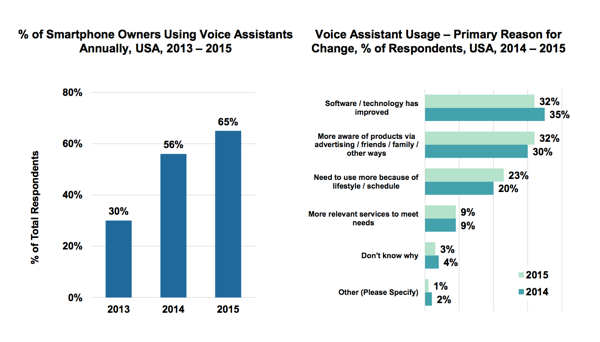 Voice search is picking up steam. You can now use your voice to search the web, play music, navigate home, order sushi or get the latest football results. 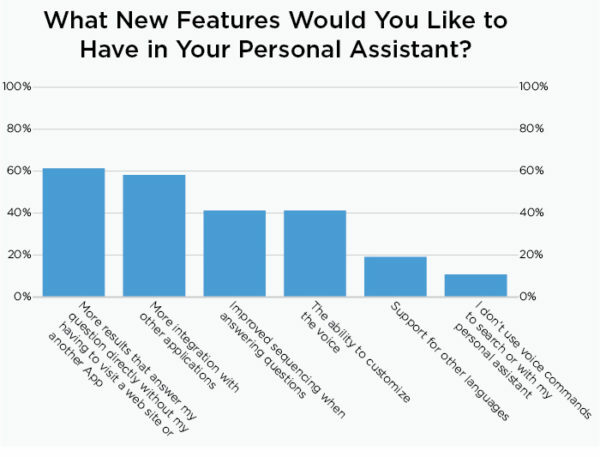 Not a day goes by without news stories about search assistants like Amazon’s Alexa, Apple’s Siri, Microsoft’s Cortana or Google’s – uh – nameless service. It seems like voice assistants are slowly taking over the world. In this article, I’ll elaborate on the rise of natural language and voice searches, plus give you tips on how to prepare your content for these new types of visitors. Google made answering questions a priority in its Hummingbird update in 2013. This update was meant to change the way Google responds to queries people write or speak. Since Hummingbird, the context of every word in the search query is taken into account. It’s no longer about the words themselves, but what they represent or mean. If you need a reminder of what Hummingbird encompassed, watch Joost explain it all in this video. Hummingbird had a significant impact on how Google scanned your content and thus on your SEO tactics. It became incredibly important to structure your text properly. Take a long hard look at the conversational queries people use to find what they need. Not only look at your data but also check how your competitors are doing and see how they are trying to answer these questions. Use the autocomplete feature in search engines to see which questions often pop up. Put the answers you find in a spot where search engines can easily filter them out. Don’t make it a long winding answer, but get to the point and serve it straight up. 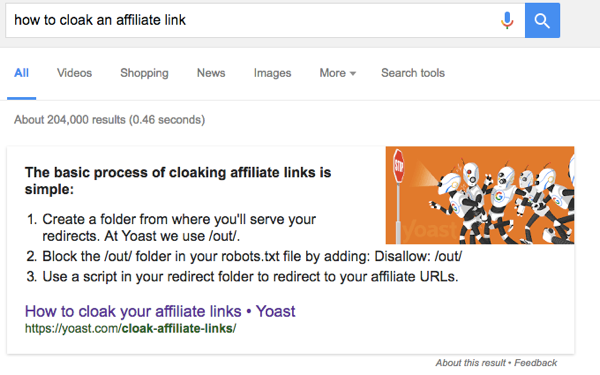 In this case, our article on cloaking affiliate links has been optimized in such a way that it can answer the question: [“How to cloak an affiliate link”]. Google figures out the question and the answer right from the content. In general, it helps if you use short answers, and present it with bullet points. If you use ten or more steps, Google will add a ‘read more’ link to the answer box, likely getting you a higher CTR. Answering questions in this way, not only gets your content ready for voice search but can also lead to featured snippets in Google, like the one below. To answer natural language questions correctly, you also need to work on your long-tail keywords. Since these spoken questions contain a lot more words than a typed search command [What is the best restaurant near De Dam in Amsterdam vs. Restaurant De Dam Amsterdam], you can use these extra words to rank for. It might make it a bit easier to rank higher for the phrases you want to be found for. You’ll also see that searchers will increasingly use terms like [best] or [nearest] to search for relevant results, so that’s something you need to keep in mind. In addition to offering valuable answers to questions people are asking, your page needs to work flawlessly on mobile devices. Check how it functions on multiple smartphones, tablets, and other gear. Is it perfectly accessible on these devices? Is it attractive, fast and easily readable? It is also a good idea to invest in a proper Schema.org implementation because this gives your pages a lot more context for search engines. For instance, you could add Schema.org markup to your review page, so search engines have a valid source to identify your authority.